Some artists prefer not to talk about their work. They want the viewer to bring his or her own personal view of the world to feel and interpret the work, unimpeded by superimposed meaning. But when I attended the recent opening at Mystery Print Gallery in Pinedale of the Art5 exhibit of new works by Pipeline Art Project members JB Bond, Wendy Bredehoft, David K. Klaren, Susan Moldenhauer, and Sue Sommers, much was revealed in meeting the artists and talking with them about their work. Knowing what the artists are thinking, what inspired their creations, the story behind it, allowed me to dig deeper to discover my own insights. The Pipeline Art Project is an eclectic group of Wyoming artists inspired by the natural landscape. It would be impossible not to be, living where we do. But it’s not just that. This collection of art addresses the human interior and political landscapes as well. The artists’ selected genres are as varied as their content, including drawing, painting, photography, two-dimensional cut-paper and sculpture. 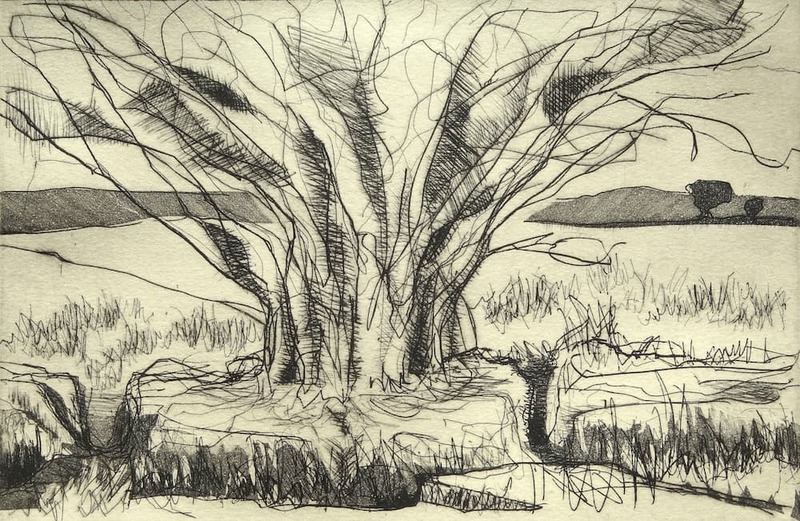 Sue Sommers found inspiration for her “Willows” works in a conversation with an acquaintance, who had observed her drawing in a sketchbook. “Why do you spend so much time on that? You can’t sell those?” the person asked. The comment got Sommers thinking. “This work is about what is private and what is public,” she explained. The “Willows” work features sketchbook drawings, pencil on paper and pencil and marker on paper. 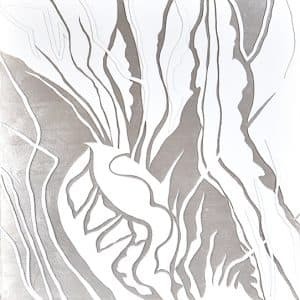 Sommers expanded on the primary drawings to create etching/drypoint prints. Typically artists exhibit just the final works germinated from sketches. That isn’t the case here. “I had to explain to this person that I have to practice,” Sommers said after she was challenged about her sketchbook drawings. But the line form that intrigued Sommers can also be very challenging. “The only time I get in trouble with willows is when I overwork them,” she said. Drawing these willows forces Sommers into easy, loose rendering. Sommer’s neighborhood willows aren’t the graceful sweeping limbs of the weeping or the golden willow. These are what I call meadow willows, the scraggly, scrappy, brushy willows that aren’t typically a source of artistic inspiration. The pencil-on-paper sketches align with the essential simplicity of the subject and yet in their starkness invite us to see more. The most worked image of the sketch collection has bright yellow-green color, added with a marker. 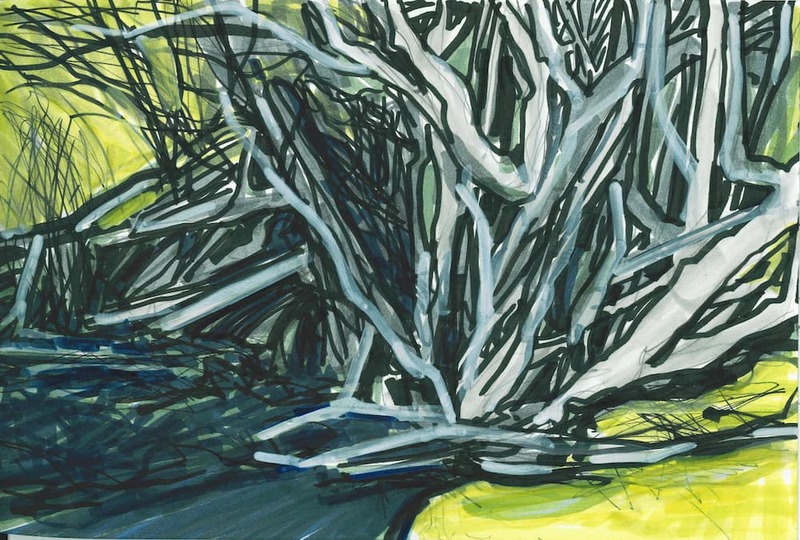 Sommers’ willow images from sketchbooks reveal insight into the artists’ practice. Art is not a job rewarded monetarily. It is a daily, lifelong pursuit, sometimes whimsical and fun, sometimes gut-wrenching, sometimes sublime, but always challenging. Sommer’s sketchbook willows pushed me to see more of the art process, beyond the sketchbook image. Susan Moldenhauer’s collection of photographs, like Sommers’ sketches, provide a reminder that the images that surround us everyday are rich for interpretation by the artist and that the rest of us are richer for it. 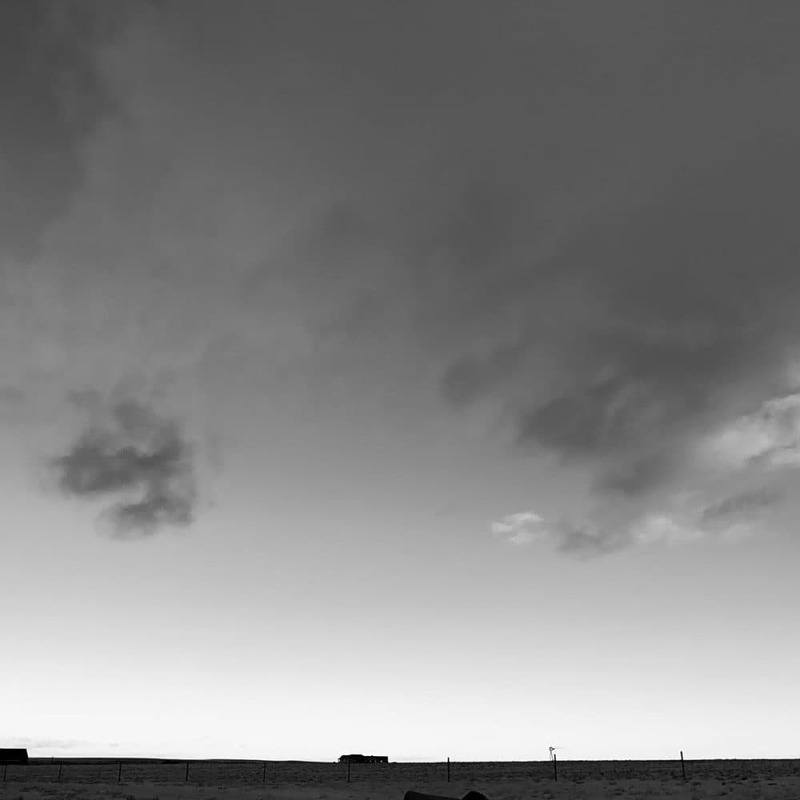 Nine years ago, Moldenhauer, a Laramie resident, began photographing the view from her home on the high plains prairie. Intrigued by the drama of ever-changing atmospheric conditions, she began by focusing on imagery of the sky without reference to landscape. Since 2010, however, the images have anchored on a reference to the land. It is those later images, those that capture the built landscape, minute in contrast to the powerful and immense sky, that sparked my imagination. It seems unfathomable that human activity could have power over those clouds, and yet it does. That’s how a beautiful photograph of the sky can become shocking. Moldenhauer’s View from Home series expands on her landscape based work that is the synchronicity of light, wind, land, and place. Individually, the images stand on their own in commanding awe of the natural world; collectively, they took me beyond the extraordinary skies of southeastern Wyoming and into the psyche. Artist Wendy Bredehoft found inspiration for her “Rabbitbrush, Ericameria nauseosa” series through the eyepiece of a microscope. She used a digital microscope to examine the physical attributes of this fall-blooming plant as the starting point for her cut paper on wood images. Bredehoft, whose prior works explored the forms created by shadow and light on the Wyoming landscape, sees her foray into the microscopic as an extension of that pursuit. “The image under the scope is three-dimensional and as I change the focus from one level to another shadows come and go. These ghost images are as important to my design as the in-focus imagery,” Bredehoft said. Drawings of these forms create a flattened view of the 3-dimensional layers. 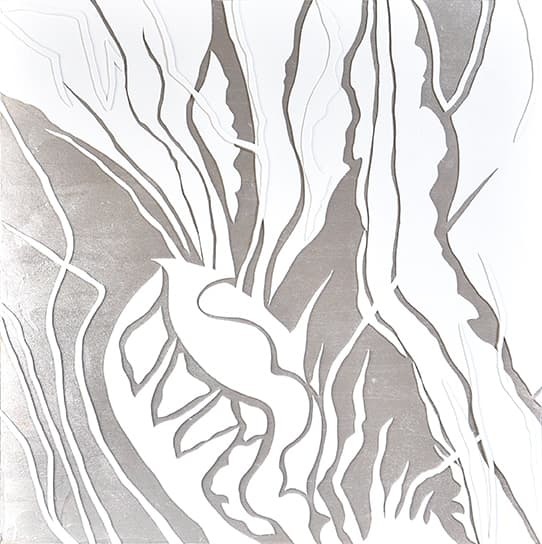 The translation of the drawings into the final form of cut paper pulls the imagery back into a subtle three-dimensional form. Bredehoft adheres the white paper shapes of the rabbitbrush to wood, coated with a luminescent pearl-colored paint. While this art begins with real life viewing, the transformative creative process ultimately yields artworks rich for interpretation and beautiful to the eye. 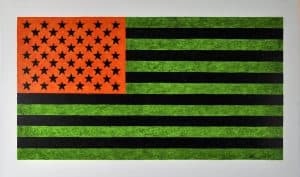 David Klaren’s India ink on yupo paintings of the American flag pose questions about the current political landscape. “I wanted to provide commentary on how that image, the most politically charged of any, is manipulated to make a statement,” Klaren said. “These flag paintings are a way for me to think about, and respond to, the current turbulent political waters we all now find ourselves in,” Klaren said. He worked on the painting over the past few months using the yupo medium, that struck me as entirely appropriate for the subject matter. Yupo is a recyclable, waterproof, tree-free synthetic paper that doesn’t absorb the ink. It’s slippery. The ink pools and dries on the surface, creating mottled lines and spaces. He prompts an answer in the painting entitled “Spectre” that features the flag with a yellow hammer and sickle image superimposed over it. “Alternative Facts #1” reimagines the flag as having green and black stripes, a red corner block and black stars. “It seems today that our leaders can tell us what they want us to believe and call it an alternative fact,” he said. Another of his flags has a larger than life, red boot print stamped over it. Sculptor JB Bonds of Daniel contributes his Cityscapes iron bas-relief and drawings to the art mix. The obvious question is how does an artist who lives at least 200 miles from any city land on this theme? Previously, Bond has explored the building-like shapes in free-standing, floor sculptures. “I like how dissimilar shapes, when clustered together, seem to become more similar,” he said. Bond’s iron cityscape images convey inhabitance with the added warmth of blocks of gold and red color. All of the iron in his work comes from resourced and repurposed material. The red was part of haybaler, the yellow from the tailgate of a Ford pickup. “The scrap pile in my yard is sort of like my palette,” he said. While thinking about the shapes and how he groups them to convey meaning, Bond found an analogy in his art practice. He said that his work as an artist blossomed when he joined the Pipeline Art Project group. Having the chance to share ideas with the five artists in this show helped him grow to be a better artist. “It is important to have a group you identify with,” he said. Even in the hinterlands of Wyoming, these five lucky artists have found a home. Art5 will be on display through June 3, 2017, at Mystery Print Gallery (https://www.facebook.com/MysteryPrintGallery/) in Pinedale. A Wyoming native and resident of Wilson for 33 years, Marylee White has worked as a newspaper writer, an arts-based preschool director and an integrated-arts, K-12 program manager. In 2015, the Wyoming Arts Council awarded her the 2015 Frank Nelson Doubleday award for creative writing.